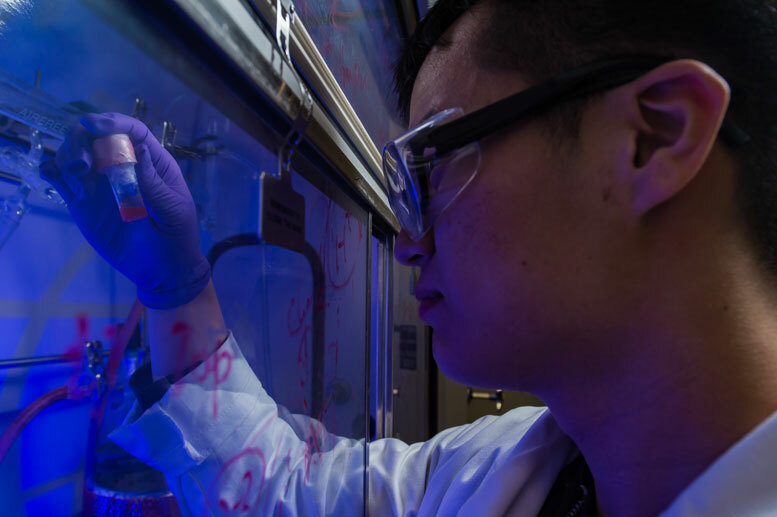 Rice University scientists plan to employ the power of the sun to build functional synthetic polymers using photosensitive quantum dots — microscopic semiconducting particles — as a catalyst. The luminescent dots are only a few nanometers wide, but are highly tunable for their unique optical and electronic properties. They are beginning to show up in modern displays, but lend themselves to industrial chemistry as well. The Rice lab of materials scientist Eilaf Egap focused on the latter with its demonstration of a stable and economical method to make polymers through photo-controlled atom-transfer radical polymerization. The method could replace molecular catalysts or expensive transition metals currently used to make things like methacrylates (common in plastics), styrene and block copolymers. The work by Egap, Rice postdoctoral researcher and lead author Yiming Huang and graduate student Yifan Zhu is detailed in the American Chemical Society journal ACS Macro Letters. The lab used various light sources, including the sun and even a household lamp, to illuminate a solution of dispersed cadmium selenide quantum dots. That introduced the generation of free radical atoms from a bromide-based initiator, which in turn triggered acrylate monomers in the solution to link. Because the monomers tested in Egap’s lab had no ability to terminate propagation of the chain, the process is called living polymerization. “It will keep going until it consumes all the monomers or you decide to terminate,” Egap said. Egap, an assistant professor of materials science and nanoengineering and chemical and biomolecular engineering, said quantum dot polymerization shows promise for highly controlled growth of sophisticated polymers. “The beauty of this is, if you have monomer A and you want to add monomers B and C in a specific sequence, you can do that,” she said. “In a random polymerization, they would be randomly dispersed along the polymer backbone. “The implication here — and part of our broader goal – is that we can synthesize organic-inorganic hybrid structures in a controlled and periodic way for many applications,” Egap said. She anticipates the process could also lead to the discovery of novel polymers. One might be a quantum dot photocatalyst with an attached semiconducting polymer that would simplify the manufacture of solar cells and other devices. Be the first to comment on "Rice Scientists Make Polymers with Light-Triggered Nanoparticles"